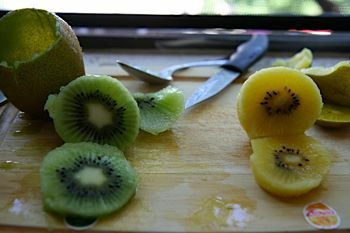 Wikipedia says: A new Cultivar Group of Actinidia chinensis known as Gold Kiwifruit or "Chinabelle", with yellow flesh and sweeter, less acidic flavour resembling a tropical fruit salad, was produced by the New Zealand Crown Research Institute, HortResearch and is being marketed worldwide in increasing volumes. 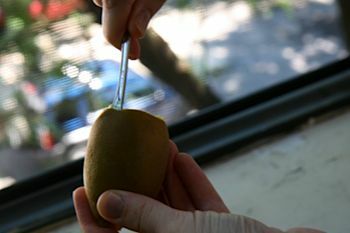 Some wild vines in China have yellow fruit but are small and not commercially viable. 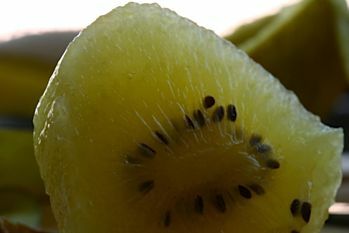 The golden kiwi was excellent. 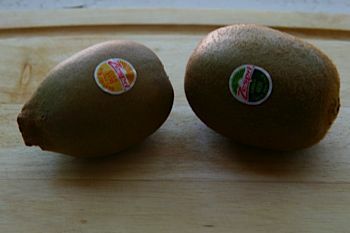 The golden kiwi strongly resembles a very soft pear in smell and taste, but slightly tart with soft-kiwi texture. It’s extremely juicy. “I could definitely crave it as a distinct taste,” said Tiff. I like the golden one better, hands down. Tiff’s on the fence.